Earlier this weekend I was considering having a Jim Carey marathon next... but when the time came... I found I just wasn't in the mood. That I am really more in the mood for some horror movies. I know... I know... big surprise there. But if I really want to get a decent marathon in this weekend (especially since it was shortened a day because of Christmas) I need to watch something I am really in the mood for. So horror it is for this weekend. This is a 5 Disc set that contains 26 short (usually about half an hour each) documentaries covering pretty much everything in the history of horror movies. This is a set I have had well over a year now... but never got around to even finishing the first disc. So I will be starting where I left off and even though I know I won't finish this set this weekend I am hoping to finishing the first couple disc anyway. A successful radiologist (Lena Headey) watches her life spiral out of control after she sees the spitting image of herself driving down a London street. Attempting to discover the identity of her double, she stumbles onto a terrifying mystery that involves her family and closest friends, leaving her with no one to trust. The Broken is one of the movies I blind bought back in October. It is one that I knew absolutely nothing about. But it was recommended to me by a few different people. And I like that Lena Headey (Terminator: The Sarah Connor Chronicles) stars in it. After watching the trailer for it I became a little concerned. I mean it definitely looked like it had potential of being good.. but at the same time what the story is about I could see them messing it up and it becoming slow and tedious to watch. What I found in this psychological horror is that it was good enough to entertain... but I was hoping for a bit more. The movie itself felt slower then it needed to be for the most part. At least until the last 15 to 20 minutes where it ties everything together. But then it went from slow to a bit on the confusing side. I watched the last several minutes 2 or 3 times and I am still not sure I got this movie completely. Though I did get enough of it to understand the answer to the main plot. And it was interesting enough to get some enjoyment of it. And there was a couple pretty cool kill scenes as well. So I am glad I got it in my collection... and I am hoping on the next viewing I will get some more of the subtle points in the movie. Robert Louis Stevenson's classic tale of good and evil has been a filmic favorite since the early silent days. Various portrayals of the dual doctor are examined. This short documentary runs 22 minutes. While I am not a huge fan of the Dr. Jekyll and Mr. Hyde story... It is a good one. I have the 1920 version of the story that stars John Barrymore. I must admit though... even though not a huge fan of the story... there is a couple other movies featured in this documentary that I would like to check out. It's been two decades since the late Ed Harley (Lance Henriksen, Alien vs. Predator) last conjured up the demonic avenger known as Pumpkinhead. So when the citizens of a small southern village discover the town's physician (Doug Bradley, Hellraiser) has been selling their loved ones' organs and dumping the bodies in a swamp, they ask the old witch, Haggis, to invoke the demon's wrath and avenge their desecrated kin. Summoned from the mummified remains of Ed Harley himself, the creature proceeds to wreak havoc upon any and all who get in its way. After twenty years in limbo, Pumpkinhead has finally returned to settle the score. This is my first time ever seeing this movie... even though I have seen all the other ones in the series. I enjoyed all the others so I went into this one expecting the same. And I did enjoy it. I liked how they brought back the character of Ed Harley. I also liked the recap of the first movie that they worked into this one. I normally don't care much for flashback scenes... but it was somehow different in this case. I think if you liked the other Pumpkinhead movies you will enjoy this one as well. Of course there's Lon Chaney, Jr. as The Wolf Man, but other films have featured werewolves in surprising ways over the years. This short running 24 minutes was very enjoyable. Of course when it comes to the werewolves I am pretty familiar to most the classics thanks the the Universal boxset I have. But there was a few mentioned here I would like to see. One that especially comes to mind that I always wanted to see is the movie starring a young Michael Landon... I Was A Teenage Werewolf. But it seems that is one movie that is not on DVD. Looks like I will have to do that at some point. Three years ago, Donna (Brittany Snow, John Tucker Must Die) watched in horror as an obsessed predator (Johnathon Schaech, That Thing You Do!) murdered her family. Tonight is her senior prom and although she's anxious about the past, she's excited to celebrate her future with her friends. What Donna doesn't know is that the deranged psychopath has escaped from the asylum. He's returned to hunt her down, intent on killing anyone who gets in his way. As the night races towards its heart-pounding conclusion, the question becomes not who will be prom queen, but who will survive the killer's rampage. You know... if it wasn't for the fact that I found this DVD for only $3 at Big Lots it would have never made it to my collection. Especially considering I found the original to be mediocre. And I wasn't expecting much better what with the fact that I don't like music. When I got this home I read all over the net how much this movie sucked... so that brought down my expectations even more. But I figured I got to at least give this movie a chance after I bought it. Not that I am surprised... but this one didn't impress me. I mean it isn't as terrible as I was expecting. And that may be thanks to the fact that I went into it with very low expectations. It really is no more then an OK movie. Lugosi was much more then Count Dracula, as you'll see in this fascinating salute to this complex Hungarian actor. This short is only 22 minutes. I have seen documentaries on Lugosi before... so I was really expecting to see the same stuff I seen before. And of course they did cover some of what I seen before... but there was also some stuff in this one I never knew about him before. That seems to be quite an achievement for such a short documentary. I should also mention that Christopher Lee does a great job as the host on this series of documentaries. Take the gothic romance of Jane Eyre, reset it in the West Indies, add the direction of Jacques Tourneur (Cat People) and the overriding terror of the living dead and you have I Walked with a Zombie. Frances Dee plays the nurse who witnesses the strange power of voodoo. 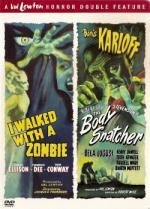 Another movie from my Val Lewton Horror Collection. Still being fairly new to the classic horrors I am still not used to the original style of zombies. When I think zombies I still think of the zombies that George Romero made so famous. That being said... I still enjoyed this movie... very much so. It has great atmosphere. I enjoyed the woman that played the nurse in this movie... Frances Dee. Checking DVD Profiler I find this is the only movie I have with her in it. Now with only 2 more movies (and 2 documentaries) left to watch in this set. I must say that the Val Lewton Horror Collection is shaping up to being my favorite purchase of this past year. Movie wise at least.